Sizzix Framelits Dies By David Tutera New- make gorgeous Flowers! SALE! Sizzix - Woven 3D embossing folder 661261. Woven embossing folder is perfect for all occasion handmade cards, invitations, paper projects, and scrapbook pages. Product Uses: card making,scrapbooking, embossing, invitations, handmade cards, paper crafts. Sizzix - Birch Trees embossing folder 661405. Birch Trees embossing folder by Sizzix embossing folders is perfect for Christmas,winter, or all occasion handmade cards, invitations, paper projects, and scrapbook pages. Sizzix - Snowfall/Speckles embossing folder 661008. Snowfall embossing folder is perfect for Christmas,winter, or all occasion handmade cards, invitations,paper projects, and scrapbook pages. Product Uses: card making, scrapbooking, embossing, invitations, handmade cards, paper crafts. Cut what you see. Plus, they’re excellent for clearly cropping photos and cutting windows in cards, bags, boxes and scrapbook pages. Sizzix Tim Holtz - Tiny Dots embossing folder 661612. Designed by Tim Holtz. Product Uses: card making, scrapbooking,embossing, invitations, handmade cards, paper crafts. Universal machine compatible including Cuttlebug,Big Shot,Spellbinders Wizard and more. Sizzix-Thinlits Dies. Thinlits are easy to use and are compact and portable. These dies are compatible with Sizzix BIGkick, BigShot, Vagabond and Big Shot Pro. Designer: Tim Holtz. Browse By Categories. Truly wonderfly. Product Uses: die cutting,card making, scrapbooking, embossing, invitations, handmade cards,paper crafts. Any card sample shown are for reference only to see product in use. Cards not included in sale. Sizzix-Thinlits Dies. Thinlits are easy to use and are compact and portable. Compatible with most die-cutting machines (not included). Designer: Tim Holtz. Browse By Categories. Helpful Links. Sizzix embossing folders - On the Go embossing folder. Sizzix On the Go embossing folder creates a fun coffee emboss perfect for any occasion handmade card or scrapbook page. Product Uses: die cutting,card making, scrapbooking, embossing, invitations, handmade cards,paper crafts. Sizzix 661081 Big Shot Tool Caddy-White 5.25"X4.5"X11"
Sizzix-Big Shot Tool Caddy: White. Great for storing small tools and more. Item # 655093. Combined with the Multipurpose Platform, Essentials Platform or Solo Platform & Shim, the BIGkick, Big Shot and Vagabond machines along with a pair of Standard Cutting Pads can also die-cut and emboss Sizzix chemically etched dies and embossing products (Clearlits, DecoEtch, DecoEmboss, Embosslits, Ink-its, Sizzlits, Simple Impressions, Texture Fades, Texture Trades and Textured Impressions). SIZ655093 SIZZIX CUTTING PAD STANDARD 1PR. Model Number: SIZ655093. Manufacturer Part Number SIZ655093. Product Model SIZ655093. Manufacturer: SIZZIX. Manufacturer SIZZIX. Weight (Approximate) 0.72 lb. Sizzix embossing folders - Wood Planks Tim Holtz Sizzix embossing folder 662370. Wood Planks embossing folder creates a simple distressed wood floor or wall emboss perfect for handmade cards or scrapbook pages for any occasion by Tim Holtz. 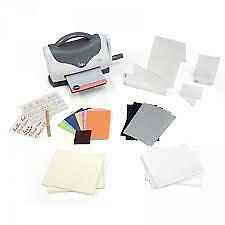 Perfect embossing machine for DIY scrapbook,paper crafts, photo album etc. 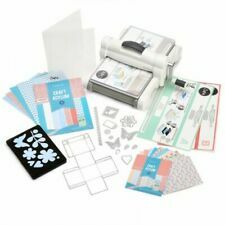 Die Cutting Embossing Machine Scrapbooking Cutter&Cutting Die Card Making Tool. Hand shake cutting dies embosser, convenient to use. Sizzix-Thinlits: Die. Thinlits are easy to use and are compact and portable. Compatible with most die-cutting machines (not included). Designer: Tim Holtz. Browse By Categories. Helpful Links. Product: Woodlands Sizzix 660978. Woodlands is a Tim Holtz design for Sizzix. It features 2 pine trees of larger size cutting dies. Successfully works in Sizzix Vagabond, Spellbinder Wizard, eBosser, and Sizzix Big Shot, and others. The card sample is NOT for sale nor is it included in the sale. The Corners folder is embellished with ornate, scrolling flourishes in two opposite corners. Product Uses: card making,scrapbooking,embossing,invitations,handmade cards,paper crafts,texturizing,embossed paper. Sizzix Tim Holtz 3D embossing folder - Winter Snowflakes embossing folder. Winter Snowflakes embossing folder creates an elegant snowfall emboss perfect for any winter or Christmas occasion handmade card or scrapbook page. Product Uses: die cutting,card making, scrapbooking, embossing, invitations, handmade cards,paper crafts. Universal machine compatible including Cuttlebug,Big Shot,Spellbinders Wizard and more. Follow manufacturer's instructions for thin cutting dies. Sizzix embossing folders - Songbirds and Lattice embossing folder set 2pc. Product Uses: die cutting,card making, scrapbooking, embossing, invitations, handmade cards,paper crafts. If it is chipboard or mat-board up to. 055in thick, then ScoreBoards dies expand your creativity with quick and easy cuts and scoring. The first-ever product of its kind! ScoreBoards dies produce sturdy boxes, pockets, holders and other ultra-versatile designs. Birch embossing folders - Tim Holtz Sizzix embossing folder. Birch Bark embossing folder creates an all occasion emboss perfect for any handmade card or scrapbook page. Product Uses: die cutting,card making, scrapbooking, embossing, invitations, handmade cards,paper crafts. The roller bearings for the crank handle shaft could be rusted and coming apart. Has the crank handle froze up or will only turn in one direction?. Sizzix embossing folders - Simple Snowflakes Tim Holtz Sizzix embossing folder 662432. Simple Snowflakes embossing folder creates a simple distressed yet elegant snowflake emboss perfect for handmade cards or scrapbook pages for any occasion including winter or Christmas. Sizzix - Lily Pond 3D embossing folder 661950. Lily Pond embossing folder is perfect for all occasion handmade cards, invitations, paper projects, and scrapbook pages. Product Uses: card making,scrapbooking, embossing, invitations, handmade cards, paper crafts. 3D Tim Holtz Sizzix embossing folders - Lumber Wood embossing folder. Lumber embossing folder creates a unique 3D woodgrain emboss perfect for handmade card or scrapbook page. These unique 3D folders add a variety of depth of embosses making it look truly like real wood.